Interesting article about Caius Rommens, one of the original creators of genetically modified organisms. He has changed his position and says that there are actually serious grounds for concern, unlike the nonsense being peddled by some anti-vaxers and vegans. The way I understand it, he says that when researchers like himself changed a gene inside a potato in order to reduce bruising, that change means that certain complicated pathways de-activate certain cellular processes in the potato — but also IN US. If they add in genes that produce poisons that are toxic to nematodes or other soil organisms, well, that is often poisonous to us as well. -THIS BOOK HAS SERVED ITS FUNCTION AND IS RETIRED- GMO potatoes are quietly entering the market place with innocuous names such as Innate, White, and Hibernate. They are suggested to have maintained all the original traits of normal potatoes and to have gained three new traits: enhanced disease resistance, enhanced uniformity, and enhanced healthiness. However, the reality is different. As a crop, the potatoes contain genetically unstable traits, two of which appear to have been lost already (or are in the process of being lost), suffer a significant yield drag and reduction in size profile, conceal bruises and potentially spread diseases, may be grown and stored in ways that maximize disease and pest pressures, and were developed through an act of biopiracy. As a processed food, they lost the sensory attributes that make normal potato foods so attractive, and they are also likely to contain new toxins. If it were up to me, the creator of these potatoes, I would call them Pandora’s Potatoes. They are the worst GMOs ever commercialized. Evidently Scott Pruitt knew that he would piss off a whole lot of people as he set out to dismantle the EPA and all of the good things that it has done in protecting and improving our environment. So he demanded, and got, a 24-hour-per-day, -day-a-week armed guard, starting on his very first day in office. Because anybody who is going to let the wealthy capitalists destroy the environment for private profit needs protection from ordinary people. I’m not making this up. Read the details here. The American Enterprise Institute has a new report that calls into question one of the foundational fallacies of the entire reform movement. Think of it as the latest entry in the Reformster Apostasy movement. Do Impacts on Test Scores Even Matter? Lessons from Long-Run Outcomes in School Choice Research asks some important questions. We know they are important questions because some of us have been asking and answering them for twenty years. For the past 20 years, almost every major education reform has rested on a common assumption: Standardized test scores are an accurate and appropriate measure of success and failure. This study is a meta-analysis on the effect that school choice has on educational attainment and shows that, at least for school choice programs, there is a weak relationship between impacts on test scores and later attainment outcomes. Policymakers need to be much more humble in what they believe that test scores tell them about the performance of schools of choice: Test scores should not automatically occupy a privileged place over parental demand and satisfaction as short-term measures of school choice success or failure. Yup. That’s just about it. The entire reformster movement is based on the premise that Big Standardized Test results are a reliable proxy for educational achievement. They are not. They never have been, and some of us have been saying so all along. Read Daniel Koretz’s book The Testing Charade: Pretending To Make Schools Better for a detailed look at how this has all gone wrong, but the short answer is that when you use narrow unvalidated badly designed tests to measure things they were never meant to measure, you end up with junk. But what if changing test scores does not regularly correspond with changing life outcomes? What if schools can do things to change scores without actually changing lives? What evidence do we actually have to support the assumption that changing test scores is a reliable indicator of changing later life outcomes? 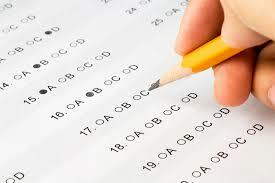 Greene concluded that tests had no real connection to student later-in-life outcomes and were therefor not a useful tool for policy direction. Again, he was saying what teachers and other education professionals had been saying since the invention of dirt, but to no avail. In fact, if you are of a Certain Age, you may well remember the authentic assessment movement, which declared that the only way to measure any student knowledge and skill was by having the student demonstrate something as close to the actual skill in question. IOW, if you want to see if the student can write an essay, have her write an essay. Authentic assessment frowned on multiple choice testing, because it involves a task that is not anything like any real skill we’re trying to teach. But ed reform and the cult of testing swept the authentic assessment movement away. Really, AEI’s third paragraph of findings is weak sauce. “Policymakers should be much more humble” about test scores? No, they should be apologetic and remorseful that they ever foisted this tool on education and demanded it be attached to stern consequences, because in doing so the wrought a great deal of damage on US education. “Test scores should not automatically occupy a privileged place…”? No, test scores should automatically occupy a highly unprivileged place. They should be treated as junk unless and until someone can convincingly argue otherwise. But I am reading into this report a wholesale rejection of the BS Test as a measure of student, teacher, or school success, and that’s not really what AEI is here to do. This paper is focused on school choice programs, and it sets out to void the warrantee on school choice as a policy. Choice fans, up to and including education secretary Betsy DeVos, have pitched choice in terms of its positive effects on educational achievement. As DeVos claimed, the presence of choice will not even create choice schools that outperform public schools, but the public schools themselves will have their performance elevated. The reality, of course, is that it simply doesn’t happen.The research continues to mount that vouchers, choice, charters– none of them significantly move the needle on school achievement. And “educational achievement” and “school achievement” all really only mean one thing– test scores. Choice was going to guarantee higher test scores. They have had years and years to raise test scores. They have failed. If charters and choice were going to usher in an era of test score awesomeness, we’d be there by now. We aren’t. So what’s a reformster to do? Simple. Announce that test scores don’t really matter. That’s this report. There are several ways to read this report, depending on your level of cynicism. Take your pick. Hardly cynical at all. Reformsters have finally realized what education professionals have known all along– that the BS Tests are a lousy measure of educational achievement. They, like others before them, may be late to enlightenment, but at least they got there, so let’s welcome them and their newly-illuminated light epiphanic light bulbs. Kind of Cynical. Reformsters are realizing that the BS Tests are hurting the efforts to market choice, and so they are trying to shed the test as a measure of choice success because it clearly isn’t working and they need reduce the damage to the choice brand being done. Supremely Cynical. Reformsters always knew that the BS Test was a sham and a fraud, but it was useful for a while, just as Common Core was in its day. But just as Common Core was jettisoned as a strategic argument when it was no longer useful, the BS Test will now be tossed aside like a used-up Handi Wipe. The goal of free market corporate reformsters has always been to crack open the vast funding egg of public education and make it accessible to free marketeers with their education-flavored business models. Reformsters would have said that choice clears up your complexion and gives you a free pony if they thought it would sell the market based business model of schooling, and they’ll continue to say– or stop saying– anything as long as it helps break up public ed and makes the pieces available for corporate use. Bottom line. Having failed to raise BS Test scores, some reformsters would now like to promote the entirely correct idea that BS Tests are terrible measures of school success, and so, hey, let’s judge choice programs some other way. I would add, hey, let’s judge ALL schools some other way, because BS Testing is the single most toxic legacy of modern ed reform. The question of exactly what it takes to earn a high school diploma in the District of Columbia, or anywhere else, is of course one for which one answer won’t satisfy everybody. Which is why whenever such requirements are set, they need to be widely debated so that the very worst ideas can at least be eliminated. My former colleague Erich Martel has brought to my attention what seems to be a ‘stealth’ attempt to completely gut the DC HS graduation requirements, and perhaps to turn them all over to whoever it is that sells easily-defrauded online courses. I am reprinting his entire letter for your edification. Please read, and take some action. Letters and emails definitely help! I read your draft proposal for changing DC graduation requirements (http://tinyurl.com/ybm63tr5) which you submitted to the Graduation Requirements Task Force (GRTF) and was shocked. I then read the minutes of the meetings posted on the SBOE website, but saw no such recommendation. Your proposal to remove all specifically named courses from the list of math (except Algebra I), science, social studies and English credit requirements for a DC high school diploma (these courses all have standards that the State Board adopted) would be a radical change that could lead to each LEA picking a random topics from each subject area, most likely taught online and assessed by online tests, approved by OSSE. Has OSSE conducted any graduation compliance audits? That would give greater control over grades to LEA administrators and replace teachers with bots. 1. Can you provide evidence that each DCPS and DC charter high school requires every student to pass all 24.0 credits that the current DC graduation requirements specify? In 2013, Mr. Hense, the founder and CEO of the Friendship charter schools, in testimony before the SBOE, submitted redacted transcripts from 3 Friendship Collegiate 2011 graduates as evidence of their achievement. Two did not have U.S. History (the third took it at a previous school); three did not have the 2nd year of world history; all three had 9 or 10 courses whose credit values were inflated. 2. How many students in each DCPS and charter high school needed one or more online credit recovery classes to receive the DC high school diploma in 2016 and 2017? 3. How many students were failing high school courses needed for graduation, but were certified to graduate in 2016 and 2017, because their teachers were pressured to give passing grades or because administrators changed failing grades to passing grades? If you cannot get this information, will you ask the members of the SBOE to request an independent audit of all DC and charter high schools, such as the one reported this past week in Prince Georges County, MD? 4. What is the source of your draft proposals? Please list the names and professional associations of any and all individuals, including registered lobbyists, DC OSSE officials or staff, education policy associations, DCPS officials, DC Public Charter School Board members and staff, DC charter operators, staff or board members, etc., who may have been in contact with you for the purpose of changing the graduation requirements that you are proposing. Since your proposal would lead to contracts with vendors of educational technology, online user licenses, etc., all of questionable educational value, it is important that GRTF members and the public know all of the details behind this unusual proposal. In my considered opinion, there is absolutely no credible evidence that the Earth has ever been visited by any members of any intelligent alien (ie exoplanetary) civilization, EVER. Which is probably a good thing, because if you look at our own human history, whenever a civilization wielding superior and lethal technology comes in contact with a different culture not so equipped, the latter end up in very very bad straits. I think I disagree with Steven Ruis on this, though I often find myself in agreement with his posts. That being said: That period of time, 1947, was just when the Cold War between the USA and the USSR was getting very, very hot. The US military was definitely trying out something-or-other, and they most DEFINITELY did not want the Soviets (or their allies) to learn anything about it at all. Kinda like nuclear weapons. Don’t forget the Rosenberg case! So, yeah, sure, the US military was going to cover stuff up, the best they could. During WW2, which had only been over for about 2 years, if the military told bald-faced lies to the people, most of them would just accept it, and those who didn’t, mostly kept their suspicions to themselves, unless they were in fact spies — and there certainly were some, we now know! Also recall that in 1947, when the Roswell event occurred, Americans were no longer bound by wartime censorship rules. So when the first ridiculously phony USAAF lies came out about whatever it was that happened at Roswell, some of the folks who noticed that the explanation was clearly bogus began asking more questions (and getting either the exact same recited BS or perhaps some new BS story) — and they began sharing their suspicions, without fear of reprisal. Some of those alternative explanations, however, remain as completely full of manure as the original Army explanation. Yes, it was a UFO – but if you realize what the acronym means, it just says ‘ there is something flying in the air and we don’t know what it is’. That’s precisely and exactly correct. I don’t know for a fact what the real story was, but I recall reading some plausible explanations by Philip Klass and others about some elaborate airborne antenna intended to spy on Russia that crashed and burned and made the military quite nervous because locals got to looking at the wreckage. Sounds plausible, and definitely not something the USAAF would want anybody to learn about other than the team who put it up in the first place, for absolutely logical reasons. So when they discovered that a lot of people HAD seen it, they didn’t have access to that little flashlight device from Men In Black. So, they made up a bogus cover story. Maybe they even thought it was OK if people thought it WAS aliens, because then the secret-device-for-spying-on-the-Russians (who we were still kinda allied with, technically) would not come to light. One thing I am absolutely positive of, is that it was NOT aliens belonging to some civilization outside our solar system. They wouldn’t have been so crude, for one thing. And if our guys had killed the aliens, you don’t think they would come back for revenge? In fact, I will bet my entire life savings that nobody can show any conclusive evidence of contact between humans on our planet and members of any alien civilization not from Earth. Here are my terms: if you take me up on that bet, and they lose (i.e. I can show within a reasonable amount of time that your evidence for alien contact is BS) then you have to give ME the same amount as I have in all my retirement accounts, plus my share of the value of the house and yard I own with my wife. I look forward to doubling, quadrupling, octupling my retirement savings! If I get 10 takers in a row, then I will multiply my savings by a factor of 1,000! Wow! I would become a multi-multi-millionaire! Oh yeah, you also have to pay the investigatory fees, up front. If I lose, you get it all back, plus my entire life savings. So what’s more logical: that the US military would lie to the public to keep some secret, or that we have been contacted by members of an alien civilization? *UFO is an acronym for unidentified flying object. OK, that insect that just flew into my leg is a UFO because I don’t know if it was a moth, a fly, a mosquito, or what. An airplane that I cannot identify is by definition a UFO. Just because something is a UFO doesn’t necessarily mean it comes from some extraplanetary civilization! Note: my explanation is not original, but I don’t recall who I should give credit to and I’m too lazy to look it up. Never mind: I just looked it up. Yes, secret balloons to spy on the Russians – Project Mogul. I think he is absolutely wrong. The amount of fuel and other resources to get to ANY other known exoplanet for even 1,000 humans is a very large fraction of our present total annual energy and materials output of the entire planet — and would impoverish all the remaining 99.9999% of the population of the planet, even the 1% who currently have way too much. For a very tiny fraction of those financial and material resources, we could devote some time, thought, planning and resources to make it so that wilderness areas are preserved, we stop filling the atmosphere with CO2 and methane, and we stop causing extinctions and fouling our own nest. In other words, we need to stop screwing up the air, the oceans, the lakes, the rivers, and the land itself. We certainly have all the money to give every living human soul a decent life, and we can preserve wild places so that there still will be wild animals running free on every single continent. To my knowledge as a fairly avid amateur astronomer, we have yet to find even a single exoplanet that humans could actually exist on. While a number of of exoplanets are calculated to be in the ‘warm-enough’ zones, we don’t yet have any way of telling whether life has arisen on any of them. While at some point, spectroscopes will be able to discern what elements make up their atmosphere, it would be a stretch to say we could tell whether there is in fact life of any sort. If some do have living cells, we would not know what sort of overall chemistry they would have. There is no magic law that we know of that says that every ‘habitable-zone’ planet has lots of liquid water, an atmosphere that we would find breathable, and living cells based on RNA, DNA, and chlorophyll. If we were so lucky as to find such a ‘pink unicorn’ planet around Proxima Centauri, the closest known star –‘only’ about 4 light years away — It would still take about 40 years to get there, at best (if we can get the speed up to 10% of c, the speed of light). Once they arive, the colonists would have to build, pretty much from scratch, all of the resources of NASA, European Space Agency, and those of Russia, China and India — combined. Which might take 50 – 100 years if they work really fast, so it could easily take one or two centuries for the first voyagers to return from Proxima Centauri – the very closest possible known exoplanet system. No thank you to the idea of leaving this beautiful blue Planet Earth en masse. It’s the only place in the entire universe that we KNOW you can find a place that is reminiscent of Heaven. Yes, life is Hell for many of its residents, but with the proper amount of good will, we could fix that. Sure, let’s keep exploring with robotic drones and orbiting and Earth-based telescopes. It’s fine to send some expeditions to Mars and other places in our Solar System that have human crews, after we’ve made it a bit safer and affordable. But don’t believe for a minute that there is any other place in our Solar System where people can safely and affordably settle and raise families! Let’s clean up our own nest instead of fouling it up some more for some crack-pot idea of massively escaping the ONE. AND. ONLY. KNOWN. HABITABLE. PLANET. IN. THE. ENTIRE. UNIVERSE. Yes, it’s true that the owners of the large corporations and those who run governments and even small farmers, fishermen and the rest of us all over the planet are in fact screwing up Planet Earth almost as fast as we can. Our continued use of fossil fuels and generation of smog and water pollution goes on apace. However, we know how to fix all of that. It’s not hard, and many places have instituted protections (regulations) that will slow it down and eventually turn it all around. Let’s fix Earth, not dream of leaving it. Sorry, Dr Hawking, you are wrong.